Once again, another great find at Marshall's! 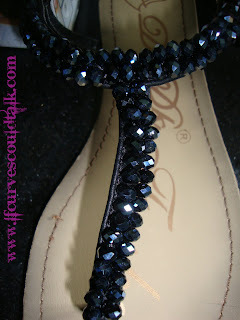 These beautiful sandals are made by DBDK Elegant Footwears The original price of these beautiful sandals are $29.99. However, at Marshall's they were $15.99 (and my mommy bought for me *Insert cheesy smile*) The black crystals are just gorgeous! Even when you are wear something frumpy, these sandals give you that "UMPH!" you need. I actually wore these with just a pair of jean shorts and a white tee and because of the sandals, it looked as if I got dressed up.